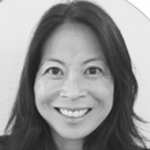 June Fujimoto is Head of Marketing at Bloomlife, a digital health start-up focused in prenatal care. Bloomlife is combining wearables with data analytics to improve pregnancy and pregnancy complications and has a partnership with UCSF’s Preterm Birth Initiative. She is responsible for the consumer launch of the first smart pregnancy wearable. Prior to joining Bloomlife, she has over 13 years of marketing experience launching new products and in developing out new markets at Medtronic and at personalized medicine start-up companies, one of which was bought out by Myriad. Last year, she won Best in Show at the DxMA Marketing Awards. Prior to her career in marketing, she was a research chemist and an actress and is still a member of the Screen Actor’s Guild. She received a B.S in Chemistry from the California Institute of Technology and an MBA from the UCLA Anderson School.